Summary from Goodreads: For fans of John Dies at the End and Welcome to Night Vale comes a tour de force of horror, humor, and H.P. Lovecraft. The surviving members of a forgotten teenage detective club (and their dog) must reunite as broken adults to finally solve the terrifying case that ruined them all and sent the wrong man to prison. Scooby Doo and the gang never had to do this! 1990. The teen detectives once known as the Blyton Summer Detective Club (of Blyton Hills, a small mining town in the Zoinx River Valley in Oregon) are all grown up and haven't seen each other since their fateful, final case in 1977. Andy, the tomboy, is twenty-five and on the run, wanted in at least two states. Kerri, one-time kid genius and budding biologist, is bartending in New York, working on a serious drinking problem. At least she's got Tim, an excitable Weimaraner descended from the original canine member of the team. Nate, the horror nerd, has spent the last thirteen years in and out of mental health institutions, and currently resides in an asylum in Arhkam, Massachusetts. The only friend he still sees is Peter, the handsome jock turned movie star. The problem is, Peter's been dead for years. The time has come to uncover the source of their nightmares and return to where it all began in 1977. This time, it better not be a man in a mask. The real monsters are waiting. 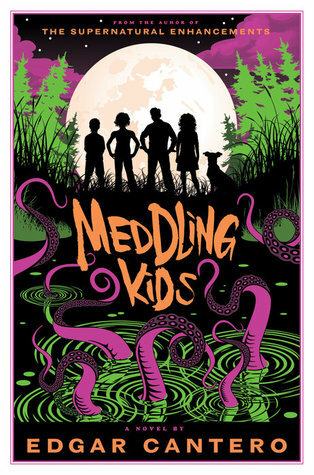 With raucous humor and brilliantly orchestrated mayhem, Edgar Cantero's Meddling Kids taps into our shared nostalgia for the books and cartoons we grew up with, and delivers an exuberant, eclectic, and highly entertaining celebration of horror, life, friendship, and many-tentacled, interdimensional demon spawn. Review: I was so excited to read this book. I grew up watching shows like Scooby Do and Inspector Gadget. Loved the mystery and suspense of the hokey cartoon on Saturday morning. When I came across this book, it was almost like the story had finally continued. Its too bad I was board reading this story. It started off pretty good. The characters were introduced, and their back stories were starting to emerge, but that's kind of where I got lost. It took way too long for the real mysteries to happen. I'm wondering if I was just expecting a mystery and got a contemporary fiction. All together, it wasn't terrible. I'm just not a contemporary fiction kind of girl. Good concept thought.